The value of the UK market for agri-food products was confirmed by Michael Creed, the agriculture Minister following a Dail query posted by Jackie Cahill, TD. Total exports to the UK market amounted, he said to €5.2 billion in 2017. Some 48% of Ireland’s 2017beef exports, valued at €1,162 million, were shipped to Britain. “Dairy exports from Ireland in 2017 were valued at €4,646m, of which 21 per cent (€997m) were sent to the UK. However, certain dairy exports (cheddar & other cheeses for example) rely almost entirely on the UK market. ” – In Budget 2018, a €50m, dedicated Brexit package which included a contribution to a €300m (joint DAFM/DBEI) ‘Brexit Loan Scheme’, at least 40% of which is available to food businesses. 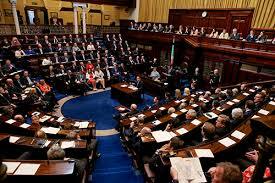 ” – In Budget 2019, a €78m Brexit package for farmers, fishermen, food SMEs and to cover additional costs related to Brexit. “It is also important to point out that the additional funding that I have provided to Bord Bia since the UK referendum – a total of €19.5 million – is being used, among other things, to provide direct support and advice to individual companies in relation to market diversification and to compile its market prioritisation reports, which are informing its own and my Department’s work in this area. “In addition, I have met with the chief executives of all of the major British retailers to impress upon them the commitment of Irish suppliers in continuing to supply the UK market post-Brexit.